I like to use drapes that reach from floor to ceiling, even over windows that are not full length. I believe the extra material helps to trap the cold air. When it was time to purchase drapes for my bedroom, I noticed the width was the same on most of the sizes, only the length changed. As I was looking for drapes that were 84″ long, I decided to purchase a set with each drape wide enough to cover the entire window. 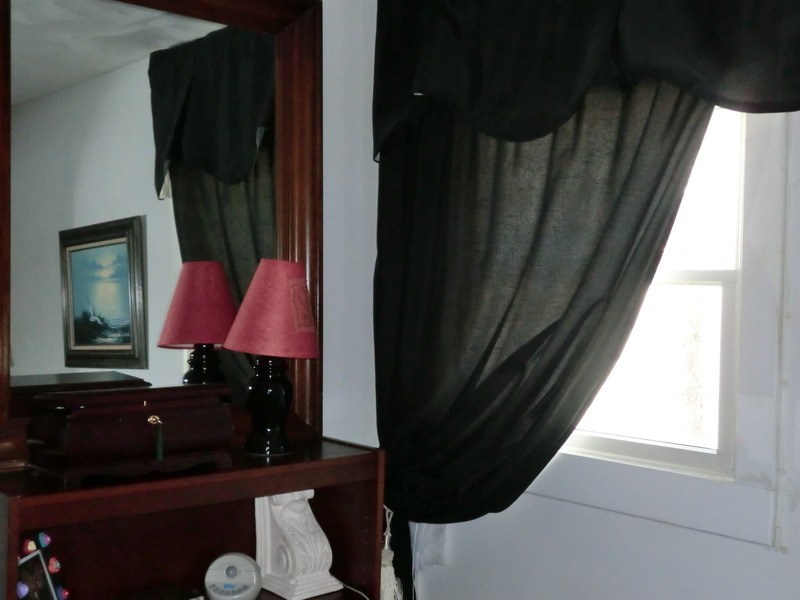 When I hung them, I used a curtain tie back one side and purchased a valance for each window. These drapes are energy-efficient, and when I sewed Velcro strips on each side of them, I was able to make them lock in the cold air at night. See “Dress Your Windows” at http://wp.me/pKNzn-t. I not only did not buy two sets of drapes, I did not need two sets of tie-backs. I did the same thing when I purchased drapes for my office. The drape on one of my bedroom windows. This entry was posted in Decorating, Energy Efficiency, Money Saving Ideas, Purchasing and tagged Decorating, Energy Efficiency, Money Saving Ideas, Purchasing by Frugal Fish. Bookmark the permalink.